We had a decently sized turnout for the event, and the evening went by quickly. While not at my own station, I did my best to see others work, but did not get to everyone. For those who followed my live tweets from the event, the remainder of article might seem redundant, but I do provide more detail. 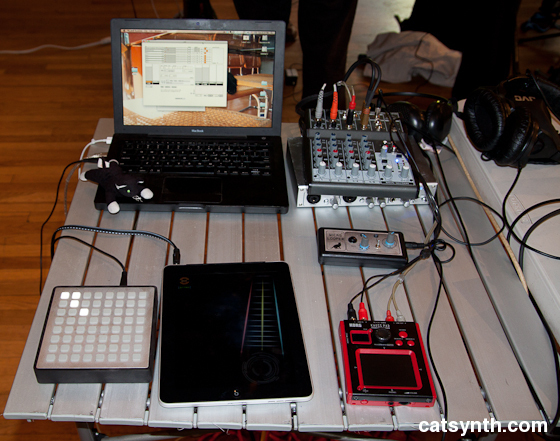 I brought a small rig that reflects my recent solo work, with an iPad as both a synthesizer and controller for software on the laptop, a monome, the Wicks Looper and a Korg Mini-Kaoss Pad. The iPad was primarily running TouchOSC, controlling a version of my piece Charmer:Firmament running in Open Sound World on the laptop, as well as a few popular instruments like the Smule Magic Fiddle and Bebot. The monome was controlling sample loops, and the Wicks Looper was feeding into the Kaoss Pad. Next me, Matt Davignon presented a turntable and effects pedals that was quite popular with visitors. There is still something compelling about a tactile and intuitive interface such as a turntable that compels people to want to play it. In contrast, the monome in particularly seemed to intimidate people. There were many non-electronic offerings as well, including the quartz cantabile by Todd Larew. Who needs electronics when you have fire as your primarily technology! 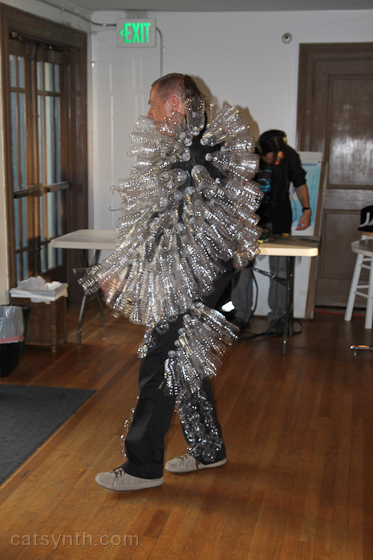 Bob Marsh wandered the hall in a suit covered in plastic water bottles, some containing mechanical sound generating elements, and was quite a presence throughout the evening. He also brought several other articles of sonic clothing for people to try on and play. Tim Thompson brought his space palette, a large wall-sized controller in which one controls sound and visuals by moving in the various spaces in the panel. I had seen him perform with the space palette before, but this my first opportunity to try it out myself. Another original instrument, the Ernestophone, featured one main string and several sympathetic strings, and a very rich sonic palette of overtones. 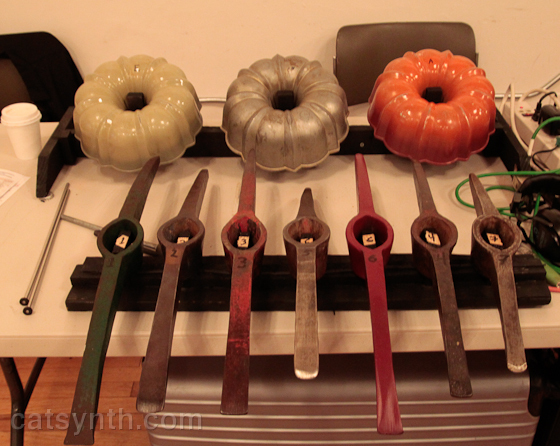 Phogmasheen presented an instrument made from pick heads and cake pans. 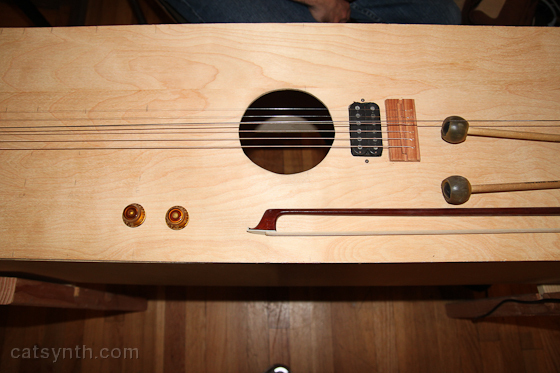 One strikes the metal elements with mallets or sticks, and then pickups process the output electronically. 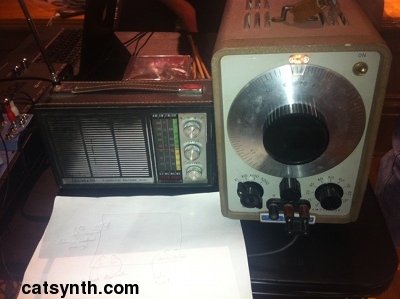 This is not the first time I have seen a classic 1950’s HP oscillator at Touch the Gear, but it’s the first time I have seen one paired with a Peerless transistor radio, for a very retro noise experience. Noise rigs are a common theme, particularly chains of effects pedals and mixers that operate solely on the noise inherent in electronic circuits but then amplify and shape it through non-linear processes of the effects change into rich and chaotic sound palettes. One example is this colorful rig from CJ Borosque. I was able to get subtle an expressive control of the sound by focusing on only a couple of knobs. 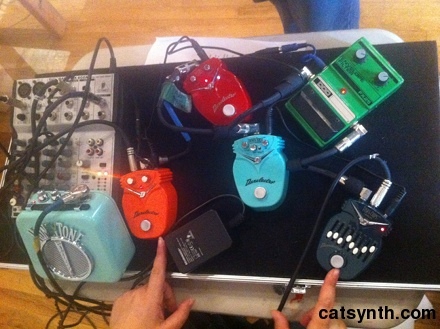 Other participants included Tom Nunn presenting one of his sonic inventions, Rick Walker demonstrating high virtuosic use of live-looping hardware and Laurie Amat getting rather humorous results from the sound of the crowd in the hall processed through a classic green Line6 delay pedal. The panel discussion on Monday night, entitled “Elements of non-idiomatic compositional strategies” was quite a contrast to Touch the Gear Night. Four composers, Kanoko Nishi, Andrew Raffo Dewar, Krystyna Bobrowski, and Gino Robair engaged in a discussion moderated by Polly Moller about their music, influences and views on composition in front of an intimate audience with plentiful wine, cheese and dark chocolate. One of the interesting questions was whether each of the composers began their ideas with sound, or a focus on sound. Not surprisingly, the answer was no – although sound was the medium of creativity, the source ideas can come from anywhere. In speaking about his piece for the Friday concert at the summit, he described how the work was influenced very directly by paintings by the Argentine artist Eduardo Serón. Gino Robair similar painted a very visual and conceptual influence for his suite based on the engravings of Jose Guadalupe Posada of late19th -and early 20th-century life in Mexico, and the skeletons and skulls in particular. Kanoko Nishi referred “music completely devoid of symbols”; and Krystyna Bobrowski described her work with her created instruments as a “sonic bloom of resonance”, perhaps my favorite phrase of the evening. Other topics discussed included composing for instruments or sounds versus composing for particular musicians, i.e., “instead of preparing the piano, prepare the pianist” (as I pianist, I am not sure how I feel about being prepared), and questions about the rewards of composing experimental music – because it was accepted by panelists and audience alike that their are neither financial nor sexual riches to be gained by this pursuit. Perhaps the response that rang most true to me was that composing music is an obsessive-compulsive activity that some of us just have to do whether we like it or not. For those who not familiar with the terms, think of idiomatic music as music that falls into recognizable patterns and genres that one can readily identify, so non-idiomatic music is music that attempts to defy such categorization. However, I often find the dichotomy not particularly useful. I sympathize with the composers’ desire to two work that transcends past categorization, and I often strive to do the same thing – but we can’t help but be influenced by the music and sounds around us, and shouldn’t necessarily fear the appearance of these influences in music that we call “new”. It was also interesting how much all four panelists distanced themselves from mathematics, even while acknowledging the deep and longstanding interconnection with music. All for composers will have work on the Friday night concert at the Outsound Music Summit. Click here for more details.